Ambrell delivers performance excellence because of our people. We'll highlight some of our outstanding employees in our blog. Today we'll profile Frank Kuster. 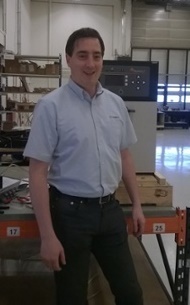 He joined Ambrell in 2004 while still in college and began with Ambrell in the applications laboratory, first in the United States and then in the United Kingdom. Frank transitioned to a sales role in the Netherlands, and then in France. He returned to the Netherlands, was a key player in opening the Netherlands office, and did work in service, sales, marketing, and of course the applications laboratory. Today, Frank leads THE LAB in the Netherlands and works on approximately 250 applications per year, dealing with an impressive array of applications and industries. Areas of focus include wire heating and steel works. He also supports sales and service with his expertise. He earned a Bachelor of Science in Mechanical Engineering from Saxion Hogeschool Euschede. Frank’s twelve years of experience in a number of roles across Ambrell’s global locations makes him uniquely qualified for virtually any application that comes his way, and enables him to deliver a superior customer experience to Ambrell clients.